World class bobble head features heavyweight, polyresin construction and comes in a colorful, fact-filled collector's box. Stands 8" tall (hairdo included). Happy trees! Royal Bobbles presents legendary painter Bob Ross as their newest bobblehead collectible! Standing 8-inches tall, this intricately detailed polyresin bobblehead portrays a lifelike image of Bob Ross with his pet bird, raccoon, and squirrel. 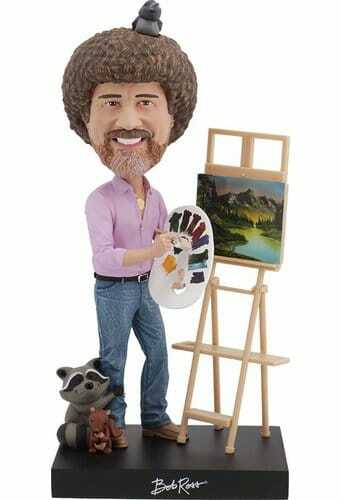 Comes with a removable easel with a choice of 5 different Bob Ross paintings. Packaged in a colorful, printed collector’s box and molded Styrofoam inner protection to keep your bobblehead safe and protected. Robert Norman Ross was born in Daytona Beach Florida on October 29, 1942. Raised in Orlando, Florida, Ross spent several years in his father’s carpentry shop after dropping out of school in the ninth grade. In 1961, Ross joined the United States Air Force at the age of 18 as a medical records technician, a post that he would keep for the next 20 years. On January 11, 1983,"The Joy of Painting" debuted its first episode on public television, where Ross’s calm demeanor and soothing voice encouraged viewers that they too could paint a world of “happy little trees” and “happy little clouds” with just a stroke of the brush. The Joy of Painting is now “The Best of the Joy of Painting” and continues airing, uninterrupted since the beginning, on about 95% of all public television stations. Late in 1994, Ross was unexpectedly diagnosed with late stage lymphoma. He passed away at the age of 52, on July 4, 1995. Many of the paintings created throughout his show were donated to charities or to public television stations.